Last Sunday I competed in my third race of the 2012 season. The Red Rock Co. 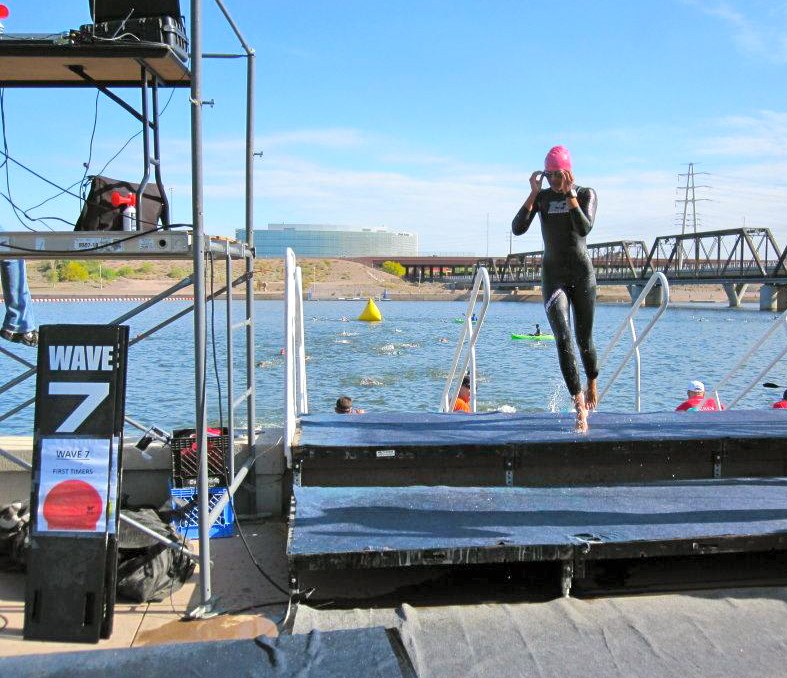 Marquee Olympic Triathlon in Tempe, AZ. The day started out great! I ran into a bunch of familiar faces the morning of the race, which is always comforting. Before the race I was feeling good, lots of positive energy and friends wishing me luck, I was prepared to race my little heart out! I was first female out of the water and on the way into transition, Oopsy #1) my Garmin fell off. (The strap broke for a second time and so I jerry-rigged my own velcro strap.) Someone kindly picked it up as they ran towards me and handed it off, no big, I strapped it back on as I ran to my bike. Stripped the wetsuit grabbed my QR Dulce and I was off. The bike was going great too, legs felt good, a female had just passed me and was about 200m ahead, but I wasn’t worried. Then I went to take a hard left turn and felt my tire almost slide out, and then Oopsy #2) I realized that my speed was dropping. I looked down and realized I could see a lot of my tire on either side of the rim. [Insert a few choice expletives here.] Hop off, change the flat, pump it back up, and then the second worst sound when messing with a tire (the first being the gunshot pop of a blowout) pssssssssst….and Oopsy #3) it’s flat again. Well that’s it I thought. My race is over, I was beyond bummed that I was going to have to DNF (did not finish). Or was it? Thanks to my hero, Chuck, I got a 3rd chance to race. The cop at the intersection had called a tech unit to come help me, but I had been waiting about 30 minutes. That’s when Chuck ran up and told me that the aid station about a 1/2 mile back had flat repair stuff. He ran back and got me a new tube and a bike pump. The silver lining and what I learned today is that a race is never over unless you say so. I jumped on my bike and rode harder than I ever knew I could, and then I managed to run a very solid 10k after. Just because my chance to place well was over, didn’t mean I couldn’t still try to perform well. No, my race did not go perfectly, and in the moment it really sucked, but discovering my ability to stay focused and stay determined was definitely worth two flats. Lastly, thank you Jen and Jasmine!! The best friends ever, who made the race possible last sunday, love you both! Next race…USAT Duathlon Nationals in 9 days!